There have been a lot of reports recently about the bad conditions and care of animals at the cat and dog pound based at Natura Parc in Santa Eugenia. In the interests of unbiased reporting I went along to see the conditions for myself last week. I didn’t announce that I was from a newspaper but instead told them that I was enquiring about adopting either a rabbit or a cat. I have to say I didn’t feel very comfortable about it, I guess I won’t make the greatest undercover reporter. But what I found may surprise you dear reader as it wasn’t all bad, despite the reports. Firstly, the staff that I met there were lovely, friendly and helpful. Secondly, yes the conditions for the cats are not ideal at the moment, but they are building a block for a cattery with indoor and outdoor facilities and room for a veterinary clinic. Thirdly, it was quite a cold day when I visited and was heartened to hear that the one poor lonely rabbit (which apparently is unusual, there are often more than one waiting for a home) was being kept in a heated area rather than unheated. I almost took this furry angora boy bunny home with me. Rabbits are free to adopt, and very straightforward. You have to produce ID and sign some paperwork. 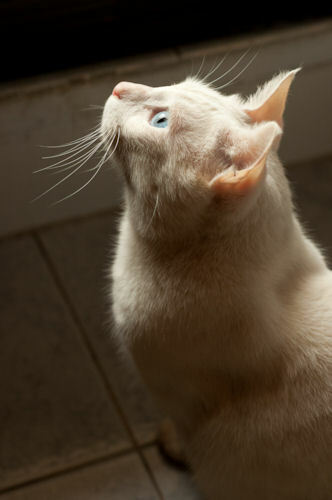 If you are looking for a cat then please consider going to Natura Parc first and seeing if any of them catch your eye. There were a couple that really stood out for me, including this beautiful grey girl, and a very chatty ginger tabby boy! Adoption of the cats and dogs is relatively cheap. 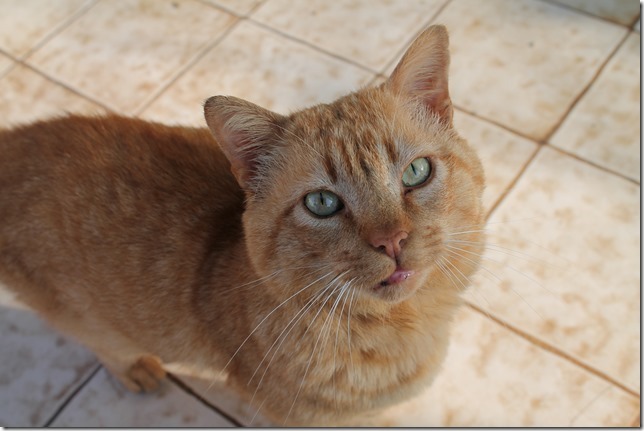 They are chipped and vaccinated and provided with a passport for 30€ per cat and 56€ per dog. The pound is open Monday to Saturday. Call for opening times 871 719 772. Natura Parc is close to the village of Santa Eugenia, on Ctra Palma Sineu 15.7km. The cattery isn’t so easy to find, but go to the main building and ask for directions. If you use Facebook then I urge you to join this new group online which is coordinating the exchange of medications for animals. It is being overseen by several vets and a chemist and is a great initiative in these times of financial crisis. Well done to the originators! Search for: Intercambio de medicina para animales solo en Mallorca. Perhaps you have some medications that you no longer need which you could donate? If you want to work on some obedience skills with your dog then get yourself over to the Dogs For U workshop this Sunday. You can book by calling 626 919 312. 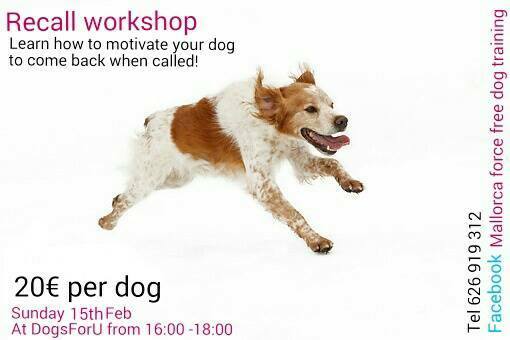 This time it will be a “Recall Workshop: Learn how to motivate your dog to come back when called”. In August Arc Animales received an email from an elderly couple in Pollensa who had a ‘kitten saturation’ situation and desperately need their help! They had contacted both Pollensa and Alcudia rescue centres who said they were too full to take any. 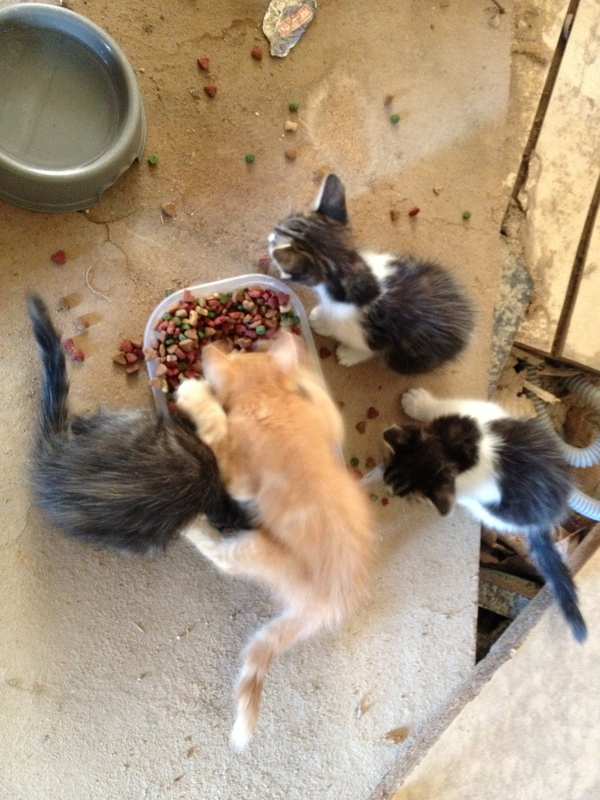 It seems the couple had started feeding three female abandoned cats late last year. Then the inevitable happened – first lot of kittens were born on the 6th March and the second on the 31st March (on their terrace) then another litter was born in July somewhere on the finca. They had been feeding them all and got themselves into a situation where they could not cope, in particular financially: in all there were 23 cats and kittens. In addition the couple were in the procees of selling their house and moving back to the UK but they were desperate that the cats and kittens find new homes and be safe. 6 young kittens which had only just started eating solid kitten food (castration will be needed later). This meant that there were three adult cats, nine older kittens of around 6 months and 6 young kittens that needed rehoming. It also meant there were sixteen cats that needed castrating immediately and seven would need castrating in a matter of months. Arc Animales got in touch with Baldea (who were featured a couple of weeks ago in Pet Project) and working with Ana Aranda Lindsay it was arranged for the cats and older kittens to be castrated in the Baldea mobile vet unit. 17 cats and kittens have been castrated. It’s been a fantastic team effort between Baldea, Katzenzuflucht and Arc Animales. Arc Animales are now looking for forever homes for the six little kittens – growing by the minute – that were too young to castrate. There are four little boys, Micah, Sima, Malin, Sujay and two girls, Pearl and Pippa. They are all between 8 and 12 weeks old. Please spread the word about these kittens whose start in life was not the best but, with your help, their futures could be. You can get in touch with June from Arc Animales by emailing info@arc-mallorca.org or visit http://www.arc-mallorca.org. Did you know that over 10,000 pets are abandoned in Majorca every year? Did you know that thousands of kittens are born on the streets with a high risk of being cruelly poisoned or killed? Did you know that hundreds of dogs live chained up as much as 23hrs a day with total indifference to the law from their owners? This week we feature Baldea, an animal protection organisation which is changing lives every day in Majorca. Petra Manuela Steiner explained what Baldea is all about. “Since Baldea relies 100% on donations, we rely on the public, on you. Baldea is working hard for animal rights aiming to give them a better life. 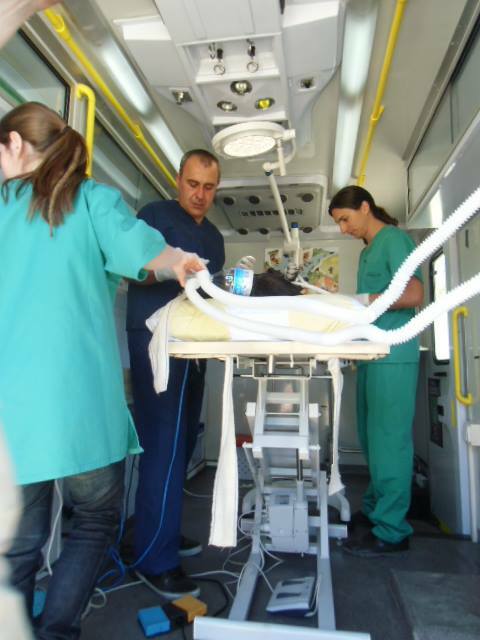 It has the first spaying ambulance for abandoned animals in Spain. 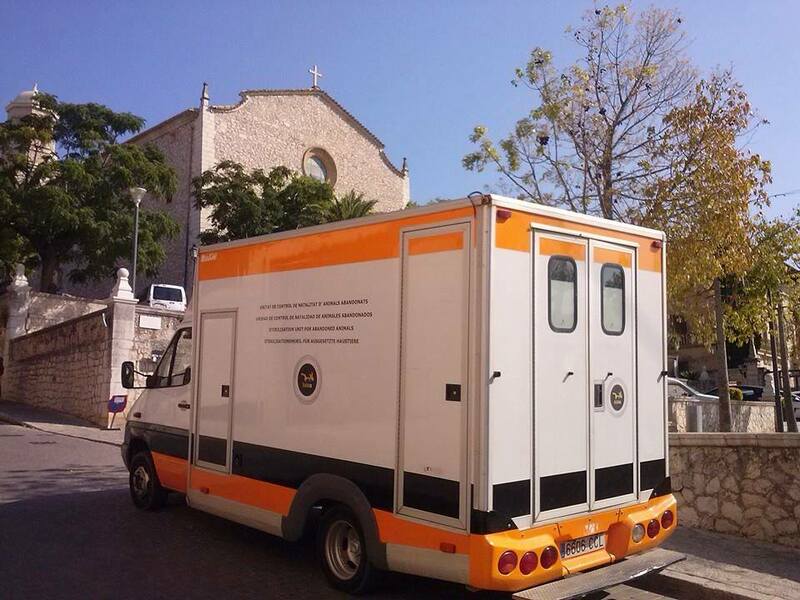 Our mobile unit travels all over Majorca with our team on board showing communities the benefits of sterilisation and how important it is. 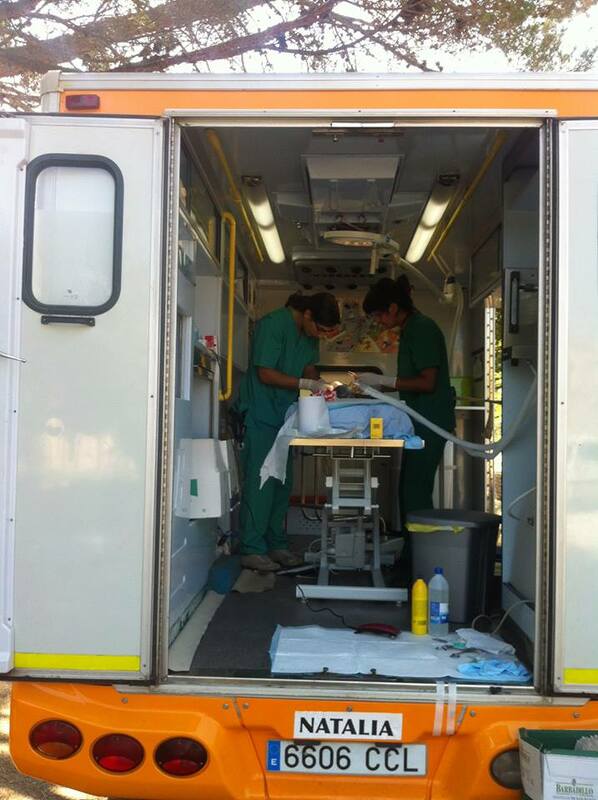 Over a hundred stray cats and dogs are spayed monthly in our Mobile Unit. We are in continuous negotiation with all the Town Halls: working to get their permission to and cooperation so stray animals will be treated in the most respectful way. “Baldea goes into schools in order to teach pupils how to treat their pets in an appropriate and respectful way: they are the future generation and they are the ones that can make a change happen. We give advice and help with all animal protection duties to associations, shelters and volunteers. And since 2010 Baldea has taken care of two big cat communities in a retirement home in Bona Nova, as an example to follow. “Thanks to Baldea ,Palma now has an Animal Protection Police Brigade. This is the first one in the whole of Spain! In 2011 we took our first steps by instructing police officers in a 3 day course. It was a big success…now it’s our dream come true! Baldea is on local television and radio on a regular basis.Baldea are on television every Wednesday at 12am on IB3 radio show “La Mirada”. We have five phone lines which receive private calls. Over 5000 people contact us yearly and 3000 follow us on Facebook. “Baldea doesn’t have any animal shelters. Every Christmas we run a campaign to deter people from giving puppies as presents, our message is seen on public buses, posters and bookmarks that are distributed all over the city. We have information points that are regularly set up in different places and events to reach the public. “Baldea spends a lot time doing inspections: these involve a great amount of pressure as the situation we see them in is sometimes terrible. To attend mistreated animal should be part of the police duties but sometimes it doesn’t seem to work, hopefully the new brigade will make this change. We present our annual report to all the public, politicians, animal lovers and friends so everybody can witness all our effort and work. In 2007 we were awarded the ”Premio Rey Jaime by the President of Majorca. “For only 50€ a year you can support Baldea. You will get a membership card and receive special treatment from several enterprises. You can find out more at www.baldea.org”. It’s cat and kitten time again! Well, kitten season is well and truly upon us. Sadly this year there have been many many reports of newly born kittens being found abandoned in rubbish bins. Of course, some of these poor little things are not going to survive, but volunteers all around the island are trying to bottle feed the ones who are found and this requires 24 hour care and commitment. 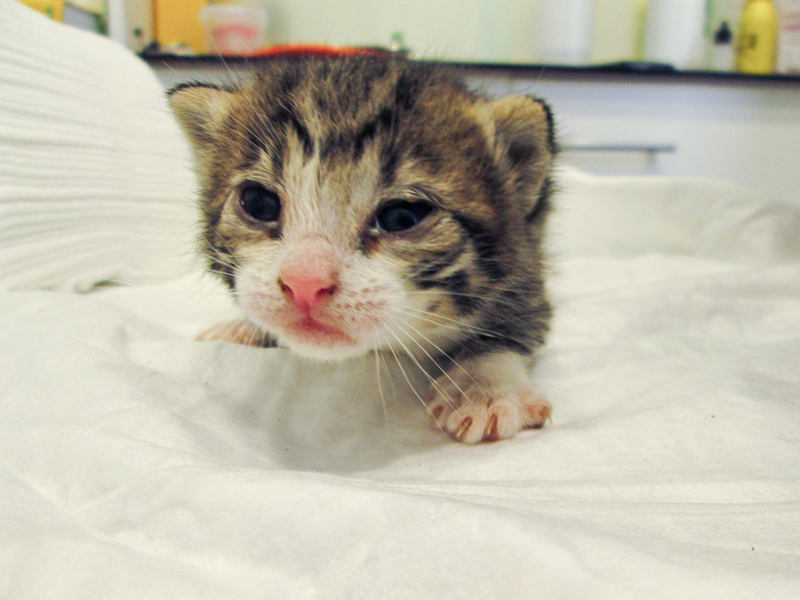 If you are able to volunteer to help raise some newly born kittens then you can get in touch with us at Pet Project and we can forward your offers on to the appropriate refuges. If you want to help but don’t think you can fulfil the demanding role of adoptive parent, then you can do that by donating kitten milk to the local refuges. Nicky at Cat and Kitten Rescue has made an appeal saying: “We urgently need kitten milk for these poor newborn kittens that are being handed in to us, These kittens need feeding every 2 hours day and night and we have kind people all over the island willing to help to bottlefeed but the milk that is needed is special kitten milk which is bought from vets and good pet stores, kittens cannot drink the same milk as we do. Is anyone willing to donate a box of kitten milk to feed these little ones and give them a chance of survival after such a horrendous start in life. Today we have rescued 19 kittens , all newborn, all now safely in the hands of people that can help them , but we need help to enable us to do this work, tomorrow and the coming weeks will be more kittens handed in. One box of milk will make all the difference, please donate and help.” You can do this by leaving kitten milk at the Salvation Army at Son Caliu or take it to your local refuges to be used there as well. 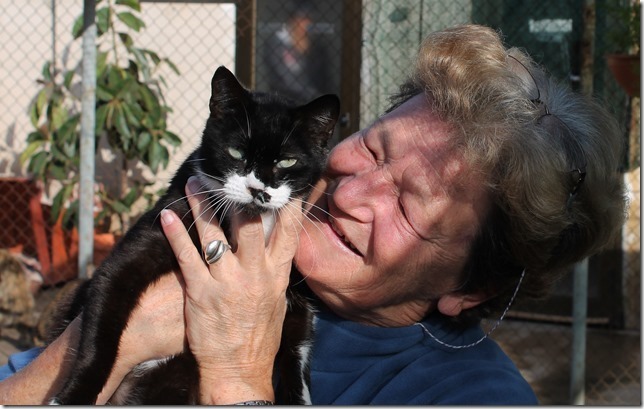 Also in this week’s Pet Project I would like to introduce to you another hard working cat lover, Tessy Myncke, who is championing the cause of the many, many cats which are left at refuges and never get homed. “Timothy is a beautiful boy that was left at the SPAP and is suffering so much, as he always has lived in a house. He deserves so much to be adopted by a good family. Tempel is a beautiful girl living for almost a year in the shelter. Her little sister was adopted months ago so Tempel is now alone. This is Dalton, he’s such a sweet and lovely cat that people left in the street. He is now also in a “cage” in the SPAP waiting that somebody “put his eyes” on him and take him home. You can see the fear and desperation in his eyes. And this is AMON, the same sad story as almost all the cats living in cages. A marvellous “big boy” (around 7 kilos….) he has also been abandoned. This is Zoe, she is a two year old Boxer/Ridegback cross. She is speyed and has all her vaccinations and passport details up to date. She loves people and other dogs, but not cats! She is lively but very easy to walk on and off the lead. Her owner has to go back to the UK and cannot take her with him, he is devastated that he has to give up his beloved dog (who was originally a rescue dog when he took her in). He is desperate to find a new home for Zoe. If you are interested to meet her then call Raymond on 674 750187. There will be a Dogs For U ‘Walk in the Park’ at 11am on Sunday 26th January through El Bosque De Bellver, the beautiful parkland surrounding Bellver Castle in Palma. Enjoy an hour’s leisurely Sunday morning walk with your dog in the company of other canines and their like-minded owners, and raise money for DFU at the same time. A donation of 5€ from each attendee will make a world of difference for the dogs in their care who are still searching for their forever homes. You don’t have to bring a dog, but if you do, please have his pet passport or vaccination certificate with you as we may be asked to show them. Now and again it’s nice to share a happy ending isn’t it? Perhaps readers of Pet Project will remember Lotte. She was put up for adoption this time last year when her owner passed away. She needed to be in a very particular type of home, where she could be the proverbial “Top Cat” and so it took some time to find her a home. But through the pages of the Majorca Daily Bulletin, and with a little bit of fortune on our side, she found her perfect match. 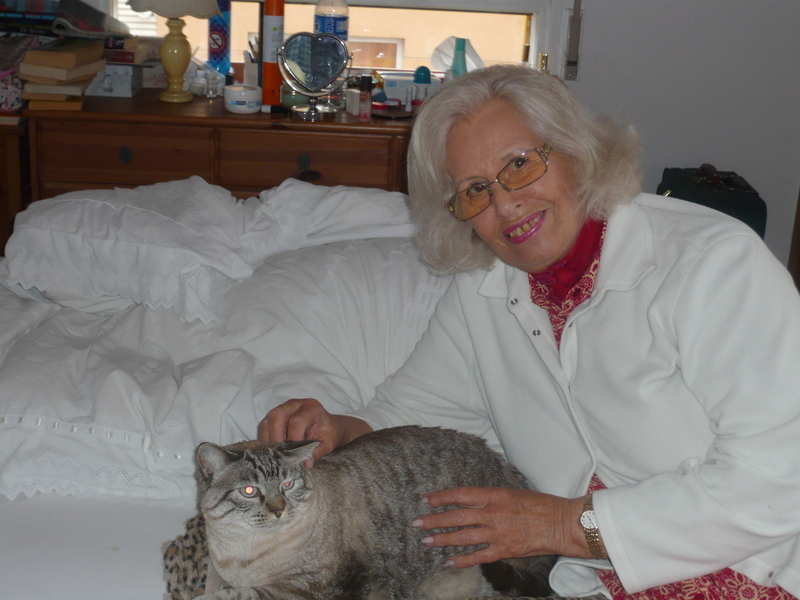 Now Lotte is living very happily with her new adoring owner Christine. All’s well that ends well for both of them. If you would like to help a homeless animal to find a permanent family or if you think you could open your doors to a new pet, then please get in touch. You can find us through www.petprojectmallorca.com or contact the different numbers directly, it’s up to you. Don’t be shy! Sometimes as well we understand that it won’t work out so animals are always offered on a trial basis at first. Fun and Games in Magaluf. 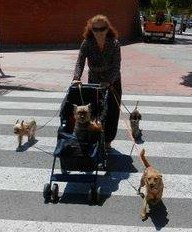 You may have seen her around, Renée Nijs is known as The Dog Lady of Magaluf. She’s the cheerful character walking her pooches around and about in a pram. Yes, a pram. This weekend coming Renée is organising and gathering together like minded people for a fundraising party for SOS Animales, and she would love it if you would join her. It does sound like a lot of fun to be honest. There will be food, drink and entry into the tombola for the bargain price of 20€ per person, plus plenty of silly party games to keep everyone entertained. It will be at the Pirates Beach Bar in Magaluf on Sunday 15th September it is scheduled to start at 11.00 and go on until 15.30pm. You can make a reservation beforehand by calling 971 131 328. Renée wanted particularly to mention all of the businesses which have been supporting her cause: Katmandu, BCM, El Mundo Restaurant, Tapas, Ecus Rent A Car, Nicky Morgan of Willies. It really has been a labour of love for Renée to get everything together as she has no car and does everything on foot. Well done Renée and we hope your event goes with a bang! Scots born Eli Whillock, who is a huge animal lover is contributing to this week’s Pet Project with her own tales of kitten rescues, can you help her home the last remaining pussycat? “My friends Sascha and Antonio were having a walk with their daughter Sophia on her horse Lluna I in Son Ferrer. They were passing a derelict building when four tottie kittens ran up to them crying their wee heads off. They were friendly, unusual as they thought they would be feral kittens. The kittens were trying to follow them, crying all the way. So when they went home they gathered dishes, food and water and returned to them… they were starving! I went with them and they were in a horrible situation, rattling around the rubble and filthy rubbish. The picture taken of the four of them gorging was their first look at food, they were lying in the dish, on top of each other, it would have been funny if it hadn’t been so sad. It was really difficult to leave them as they were running after us like we were the Pied Piper, screaming in distress. We knew there was nothing we could do at that point, so they were left in the building that night and our friend Claire went in following morning, she visited them, fed and watered them again. One was missing, but we later found out that it was found by a local lady who has many cats, and she took it in. “We decided we couldn’t leave them there but there was no room at various shelters to take in more kittens, so Claire offered to house them in her laundry room on a very temporary basis until we could, hopefully, find homes for them or find someone to foster them. We managed to cobble together a bed, litter tray, lots of food and toys and Claire’s laundry room was a much better bet than where they were, 50 yards away from a farm with lots of large dogs, and right beside a busy main road! It was not good. So off they went with Claire to Paguera to be looked after by Claire and her little boy Fred. “So now there were three. Claire managed to find a fabulous home for one of them, and the tabby and white boy was picked up on Monday. I decided to give the ginger boy a home. Claire has 3 cats already and Sascha has 6! “So now we are one! A little tabby girl… Claire and I took the kittens to see Ricardo the vet in Paguera who very kindly offered his services to check them over. Healthy looking wee souls, no fleas and he wormed them for us. Ricardo reckons they are about 7-8 weeks old. They are all extremely tame, enjoy being picked up for a cuddle, munching and drinking well and are using the litter tray no problem at all. “All we need now is a kind soul who has been thinking of adding a cat member to their family, or who knows that one more wee soul won’t make that much difference to the one or two they already have, to come forward and give her a loving forever home.” You can get in touch with Claire at claire@proguardplus.com and Eli at eliwhillock@aol.com. This week we have two beautiful cats from Mininas, the cat rescue organisation in Palma, and a fantastic opportunity to meet the good people of Dogs For U. Thanks to Cati Salva and Shane Green for their beautiful photos. Kinder is around 2 years old. She was rescued in the cemetery area in Palma where she had been abandoned heavily pregnant. She had 5 little cuties and raised them like a super mom, all chunky and playful. 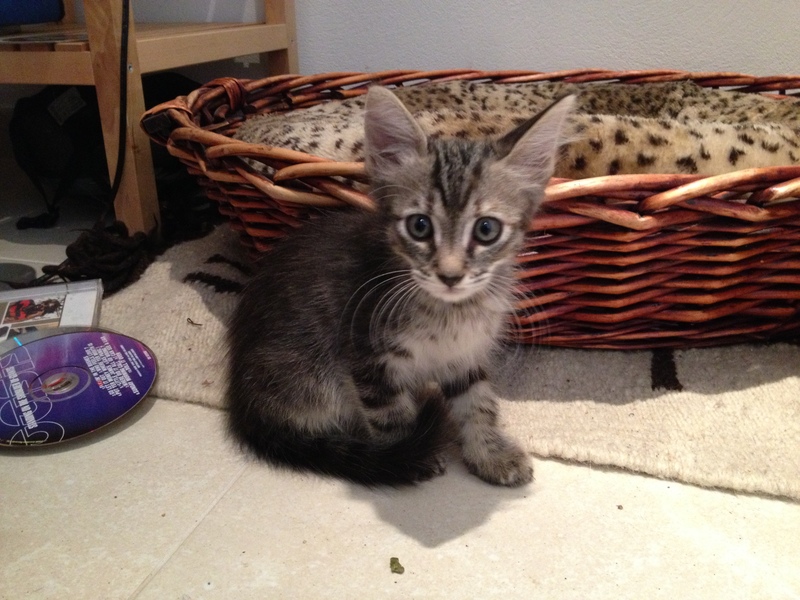 All of the kittens have gone to loving homes, but nobody has taken any interest in Kinder so far. She is affectionate, sweet and loving. She purrs a lot and loves to have people around. Narnia is one of the unluckiest cats that Mininas have found so far. She was a street cat, but sweet and tame. She had a litter that someone threw in the trash bin, but she was not neutered at all. Then she somehow got hurt in her right eye and lost it. When they spotted her she was in very bad shape, the eye closed, the fur gone in certain spots. She turned out to be allergic to flea bites. 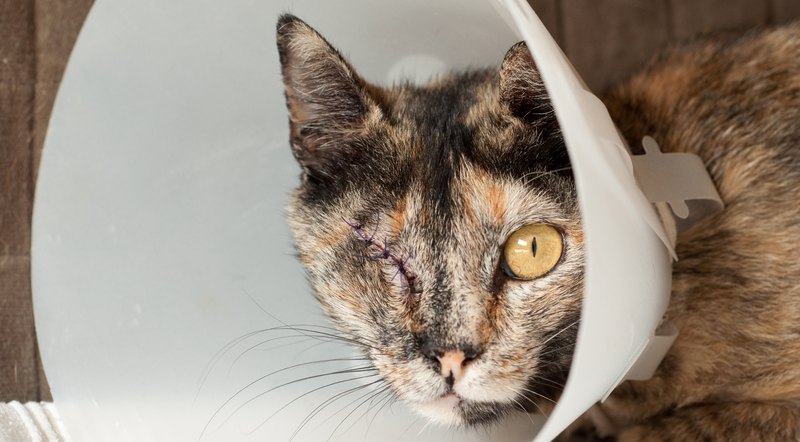 The surgery was performed to take out the bad eye and close the socket to avoid further infections, and on the surgery table she was found to be suffering from mastitis. She had to have additional surgery in her breasts and had a long, painful recovery. While all of this happened, she was miserable. She had to wear a collar so that she didn’t lick the stitches and was not happy about this at all. She didn’t know how to move with the collar, she felt trapped. She was however very affectionate, purring from the moment she saw you, but she didn’t move out of fear. Those times are long gone. 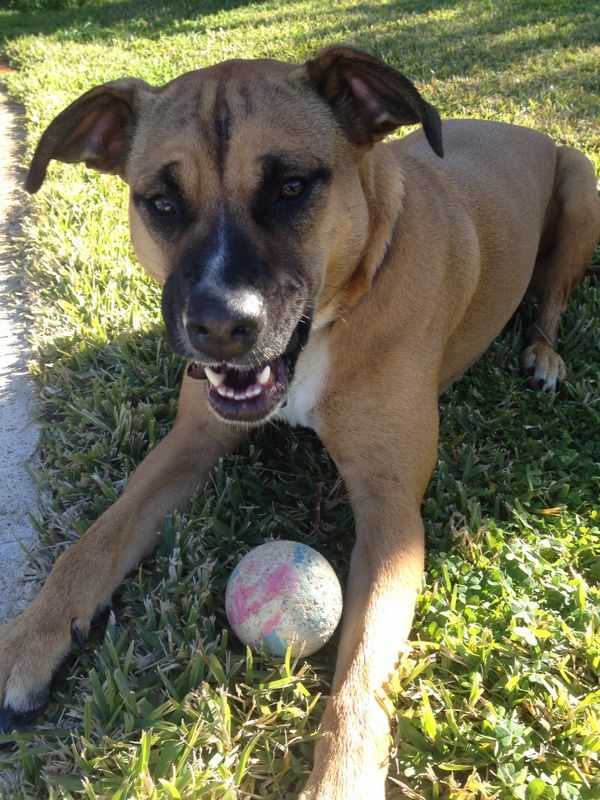 She is now free from the collar and has been gradually relaxing at her foster home. She is shy when she first meets a new person, but once she gets used to her surroundings she plays and moves around like any other cat would. 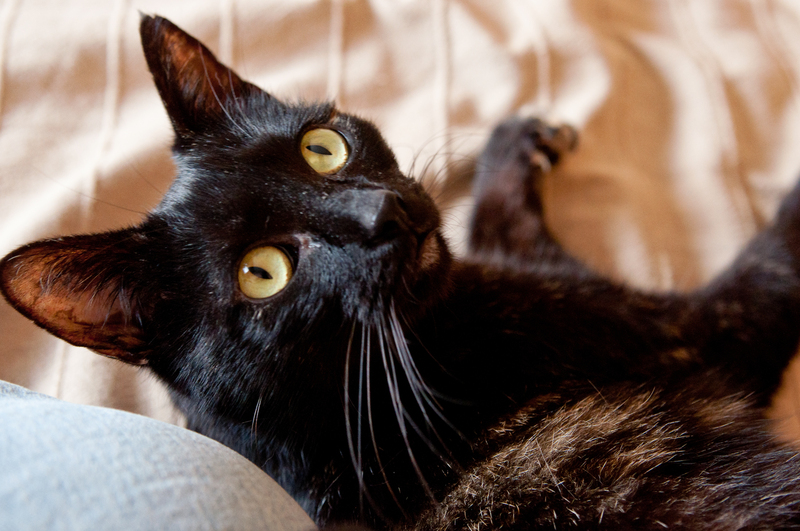 She is a quiet cat and would work best in a quiet home – preferably with little other feline company. She is okay with another cat or two, but multitudes are not to her liking. Because she is shy, she needs a sweet, loving, soft person by her side that would have the patience to let her move and socialize at her own pace. 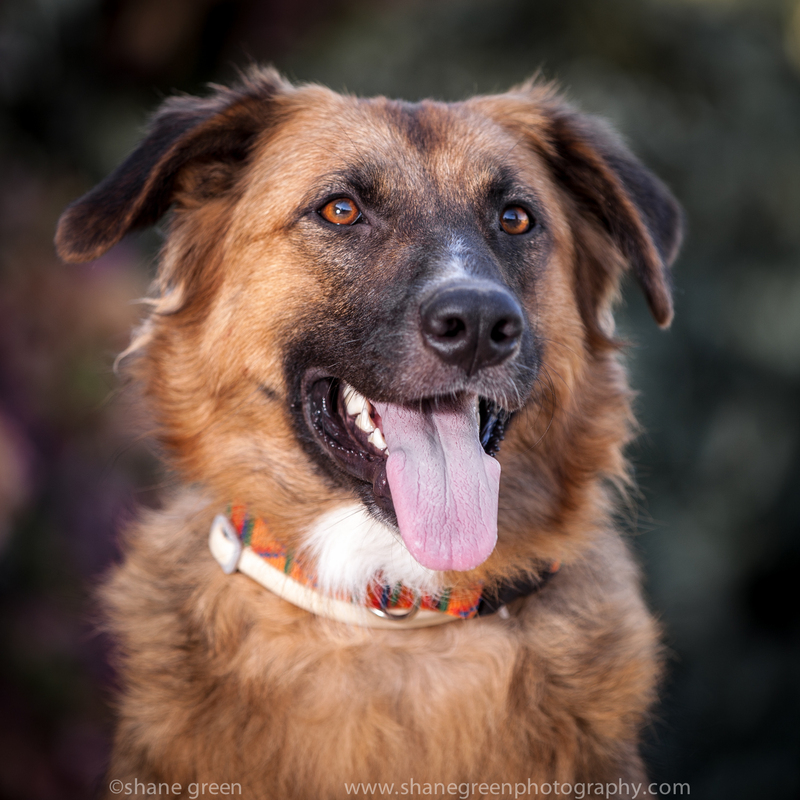 SANDY, is a beautiful GSD-mix, young adult, soft and fluffy, full of beans and utterly adorable. Sandy would benefit most with an active family, who thrive on walking and getting exercise and devoting time to playing with and training a new family dog. You can meet Sandy on Sunday at the Dogs For U Open Day waiting to put dusty paws all over clean clothes! The open day will be on Sunday 1 Sept from 4pm to 8 pm. There is a map available at http://dogsforu.org/ There will be dog agility demonstrations by PerrosYMas (Hundeschule auf Mallorca), cakes, drinks, tombola, clothes, bric-a-brac and a chance to meet the dogs and the DFU volunteers. You can get more information from 971 14 23 11. Every week the PR firm Phoenix Media aims to help an animal rescue organisation and re-home an animal with the collaboration of the island’s best amateur and professional photographers and the Majorca Daily Bulletin. With the support of the Majorca Daily Bulletin, the refuges and the general public and with our increasing success of homing animals Pet Project is beginning to gain momentum. This week we welcome a guest writer, Llúcia Benito and photographer Cati Salva to tell Asmaar’s story. 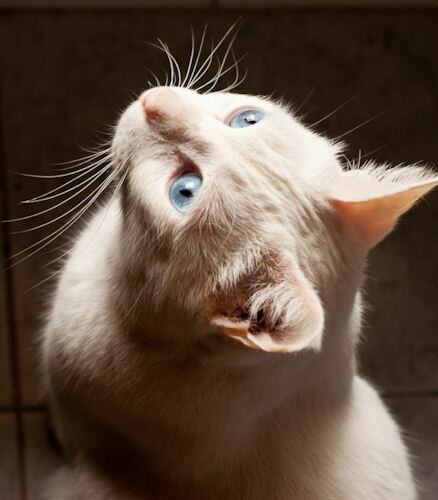 Asmaar is a loving, kind and grateful cat, white like snow, with beautiful blue eyes. 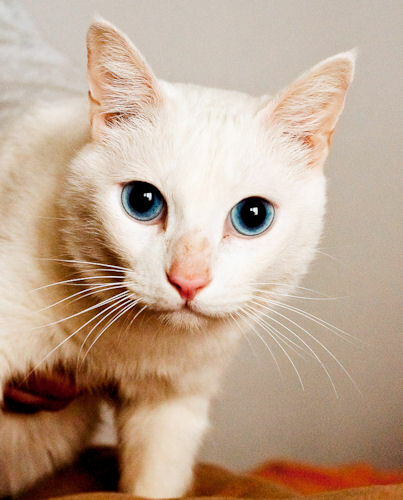 He is deaf, but this is not a problem for him, he’s just like any other cat. Asmaar was found by Jessica Cusinier in Manacor inside a shoebox about to die, when he was less than a month old. At that time, Jessica was working at a veterinary clinic in Montuïri and she took him to the vet to try to save him. They fed him with a syringe, kept him in an incubator and held him for hours every day to keep him warm, and gave this little guy lots of affection and love. Every day was a new challenge for Asmaar. The vets and Jessica, knowing how he was found, so small and without a mother, did not have much hope of him surviving. To everyone’s surprise, he managed to get to two months of age, and Jessica could finally take him home and adopt him. She had a dog, so Asmaar grew up with dogs. A few years later Jessica moved to Palma and took Asmaar and Minkie (Asmaar’s best buddy) along. Because of job issues, Jessica had to move to Catalonia and left the cats in the apartment they rented to students. We can say that thanks to this fact, Asmaar has met many people: he is sociable and likes to be around people. It was in this apartment that I, Llúcia met Asmaar six years ago, because I am friends with Jessica. But it wasn’t until late 2012, by a twist of fate, that I ended up living in this apartment. So I have personal experience of living with Asmaar, he is a lovely cat. But now the lease contract is about to end and this student accommodation will be closed down and so Asmaar needs a new home. He is currently being fostered but he really needs a permanent home. The woman who takes care of Asmaar cannot keep him for much longer. She starts working soon and has to travel a lot, and Asmaar needs a special person to adopt him. Asmaar needs a person who can feed him small amounts of food three or four times throughout the day rather than bigger less frequent meals. So logistically his new home must be able to do this. 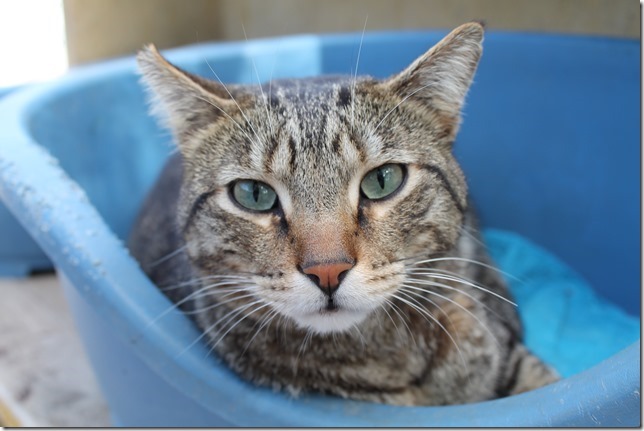 Asmaar is quite territorial and therefore needs a home with easy going cats or no other cats at all. If you are looking for a new loving, calm and quiet companion, Asmaar is waiting for a second chance. You can contact me, Llúcia Benito either by email at lluciacbn@hotmail.com or by phone at 626083558. 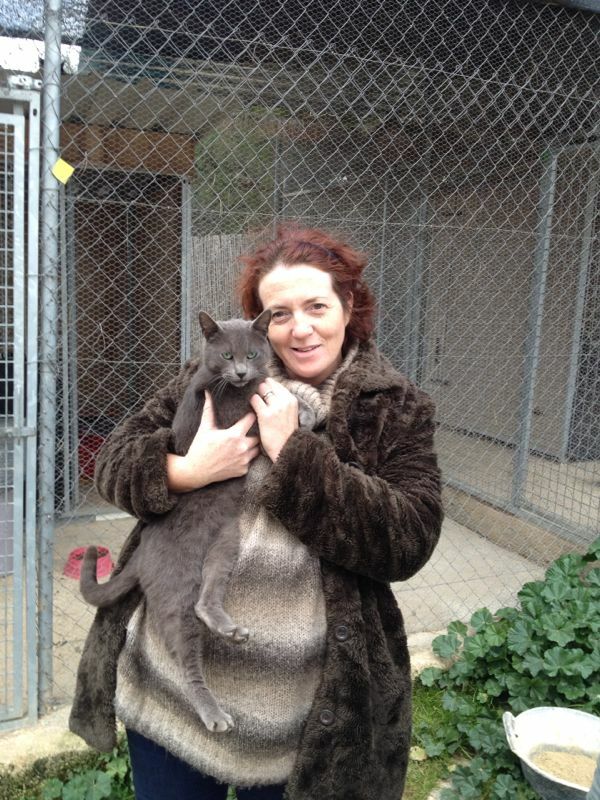 Every week Pet Project tries to help or re-home a homeless animal in Majorca. Pet Project is supported by the Majorca Daily Bulletin, the PR business Phoenix Media Mallorca and several professional and amateur photographers around the island. You can get in touch with Pet Project at http://www.petprojectmallorca.com.